My husband was asking me what I want for Christmas and I couldn’t think of anything that I need…until now! I want a crepe maker. I’m sure I’ve already told you of the horrible fish & cream sauce we had to eat each Christmas morning when I was a kid until I finally convinced my mom to ditch that tradition and make Christmas crepes instead. Crepes are so delicious though that I certainly can’t wait until Christmas each year to enjoy them. Have you ever had crepes? 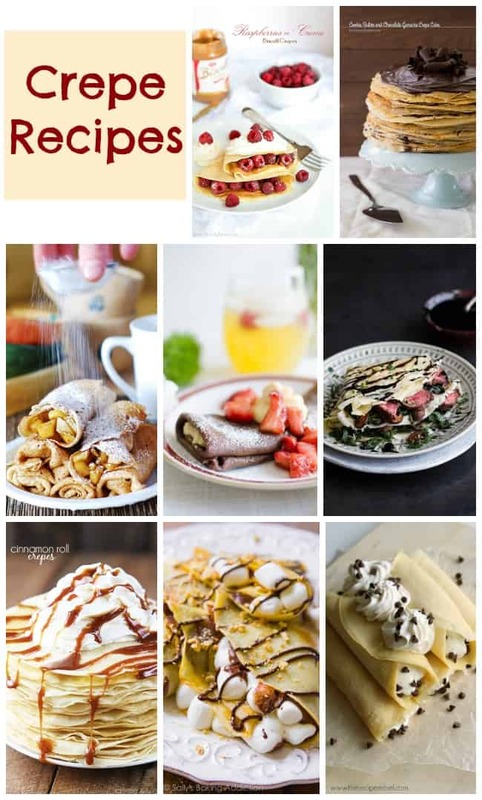 After you look through this delicious collection of crepe recipes, you’re sure to add a crepe maker to your Christmas list too. You don’t need a crepe maker to make crepes but it certainly makes the process easier. This is a collection of crepe recipes from other talented bakers and bloggers. To view the full recipe for each, simply click on the title of the recipe and it will open in a new window for you. 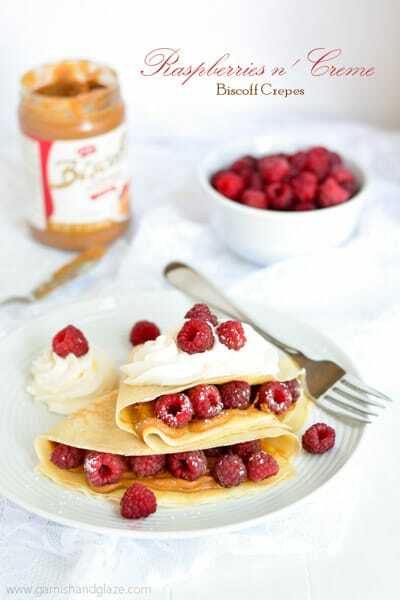 These Raspberries n’ Creme Biscoff Crepes (pictured above) by Garnish & Glaze look like they came out of a restaurant. Not only are they picture-perfect but I bet they are delicious too. These Cinnamon Bun Crepes are more of a dessert than a brunch…but it’s never too early for sweet treats, right?! 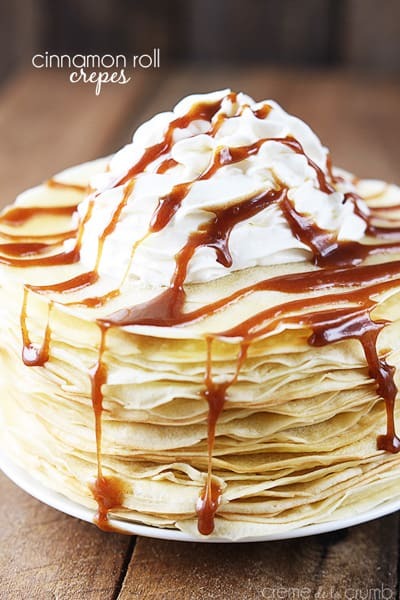 Crepes as a cake? How did I not think of this earlier?! 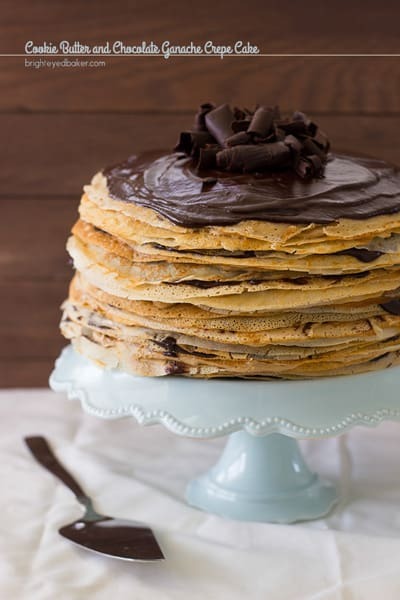 Guess what I’ll be requesting for my next birthday cake – this Cookie Butter and Chocolate Ganache Crepe Cake by Confessions of a Bright-Eyed Baker. I don’t think I can wait until my next birthday in June though…celebrating half birthdays is a thing now, right? 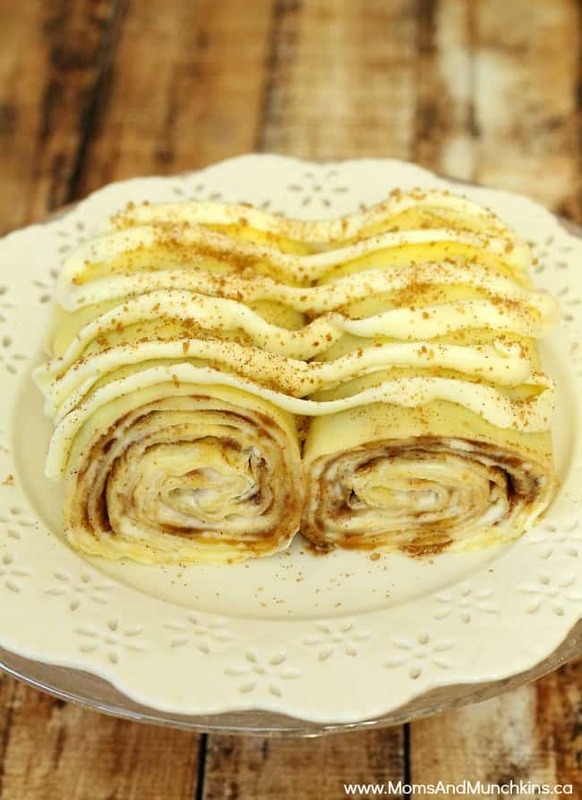 These Cinnamon Roll Crepes by Creme de la Crumb look incredibly addictive and perfect for dessert. Who am I kidding…I’d eat these for breakfast! 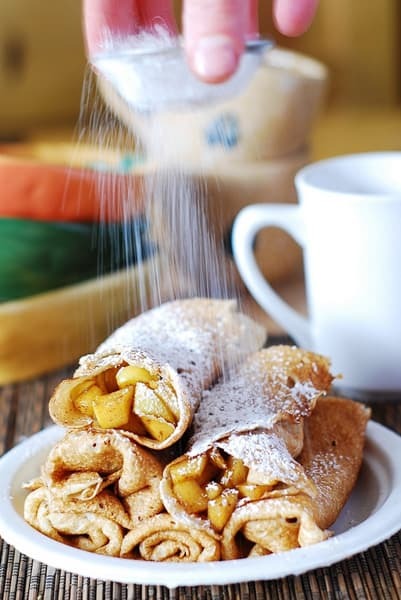 These Apple Cinnamon Crepes by Julia’s Album can be part of your healthy diet. After all, an apple crepe a day keeps the doctor away…or something close to that. 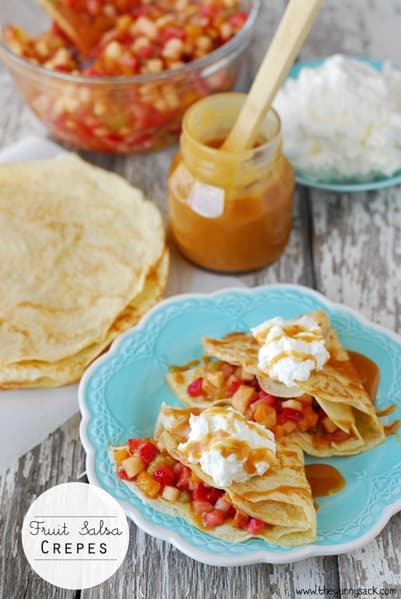 These Fruit Salsa Crepes by The Gunny Sack are loaded with healthy fruits and are sure to become a new family favorite. Did you know that crepes can also come in a chocolate flavor? 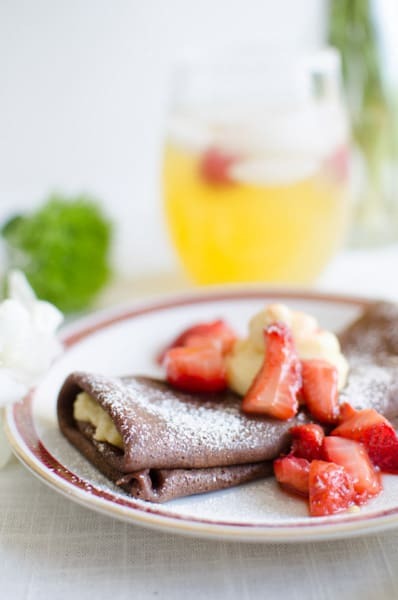 These Chocolate Crepes Recipe with Strawberries and Cream by Oh So Delicioso are sure to impress your next overnight house guests. Be careful though…if you feed them too well they may never leave. I don’t know if I’ve ever had a cannoli. 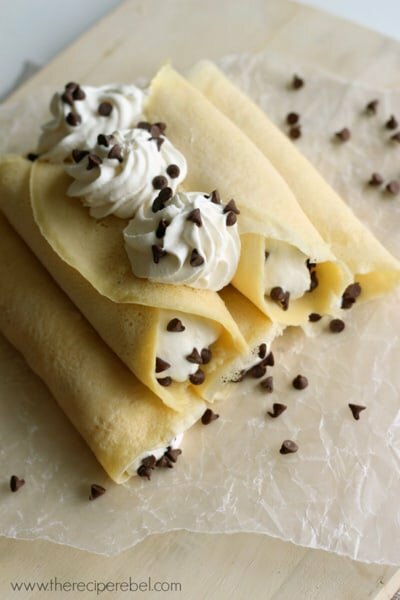 I’ll have to change that soon and try these Cannoli Crepes by The Recipe Rebel. Sally’s Baking Addiction always has the most clever food combinations. 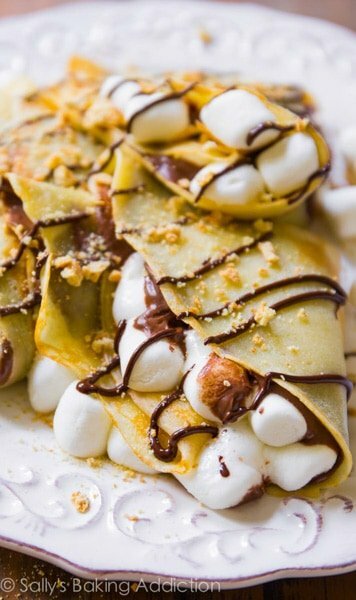 Check out these S’mores Nutella Crepes. Now that I have you all craving fruit, whipped cream and sugar, let’s switch focus to some dinner crepes. 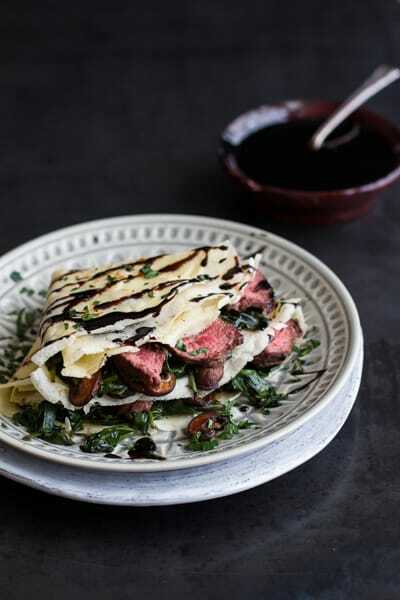 These Steak Spinach and Mushroom Crepes with Balsamic Glaze by Half Baked Harvest would be gobbled up by my husband in no time. 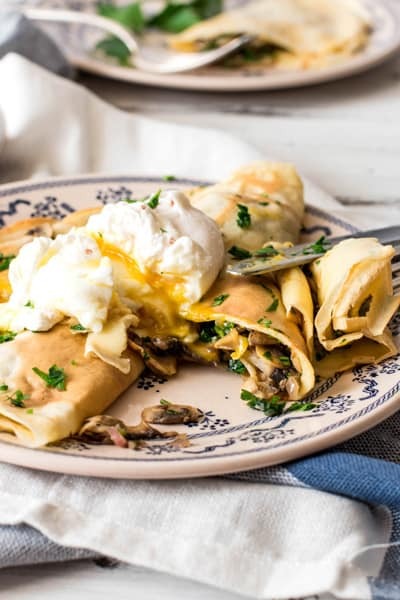 These Mushroom Crepes with Poached Eggs by Savory Nothings would be perfect for breakfast or supper. Now I’m really hungry for lunch. For more delicious recipe ideas including pancakes, fruit smoothies, crepes and more, visit our Party Food & Family Meals page. Looking for more delicious breakfast or brunch ideas? 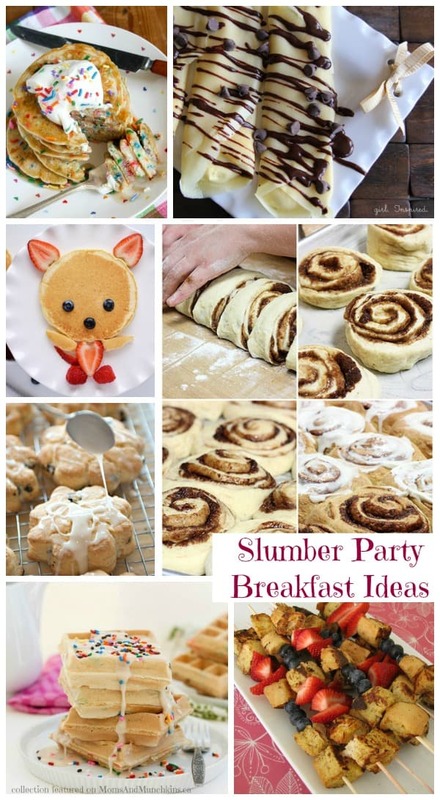 Check out these fun slumber party recipes. You’re welcome! Or if you’re on a diet, I’m sorry. We’re always adding new & delicious ideas. Never miss an update by following us on Facebook, Twitter, Pinterest, Google + and Bloglovin’.